I turned the burners off around midnight, at barely ▲05. I didn't bother to block the burner ports or shut the damper. When I went out in the morning, I still had color in the chamber. Whatever the issue is, it is not that this kiln is shedding heat. The laws of physics apply to me as well as anyone else. 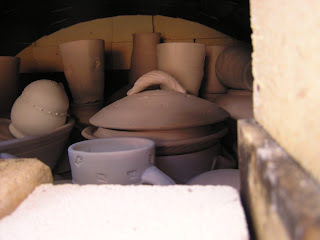 If I get the physical properties of the thing right, this kiln will reach temperature. There's no such thing as a curse. The most likely culprit -- the stack height -- is the easiest fix. The necessary cost of not letting the possibility of failure daunt one, is, well, the occasional reality of failure, however temporary. It's a high price but a fair one. 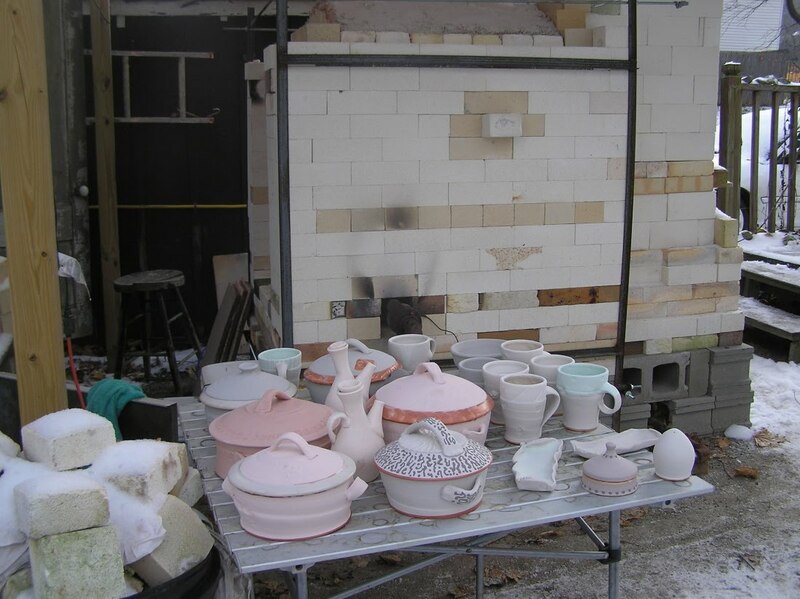 My plan -- and I do have one -- is to leave the kiln loaded (I already blocked up the ports & damper), get a bunch more hardbrick, and build the stack another...3 feet, say. Didn't reach temperture. I'm going to bed. 5:16 am: It's even colder than predicted, and I am noticing that I should have dipped the kiln furniture. There is a rime of ice over the kiln wash bucket. 6:46 am: How did it get so late? The first layer is loaded. Taking a break for breakfast: Thanksgiving leftovers. This seems so delightful to me that I am considering a Thanksgiving firing every year; but perhaps I am getting ahead of myself. 8:00 am: I am of the lick-and-stick school of wadding -- how about you? 11:30 am: Here is a moment of every firing that I hate: "Whew! So glad to be done loading! Now to light the burners and take a nap -- oh, crap. Still have to brick up the door." It only lasts a split second, but it happens every time. 1:00 pm Mudding up the door, and sealing with newspaper & slurry. Burners are on, wool over the arch. Here's a little trick I learned in Minnesota: I start a fire in the stack while the kiln is cold, to get a column of warm air moving upward. 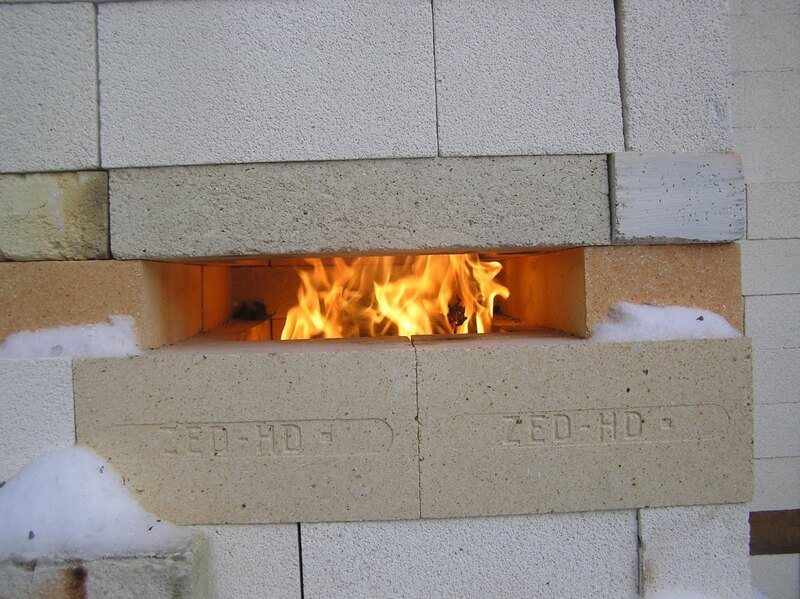 This helps start the stack drawing, and is thought to prevent uneven heating early in the firing. And now...now we wait. I'm off to take a bath, do some yoga, figure out something for lunch. ( I wonder if there's any pumpkin pie left?) I'll be back later when there's news to report. Here are a few pots for tomorrow's firing. I'd like to start loading now but don't dare becaue it is expected to be so cold tonight, and I don't want the pots to freeze; I have written off candling as a waste of money & propane, and an environmentally unsound practice. Unfortumately that means loading & firing happen all in one day, in cold weather. Anyblah. 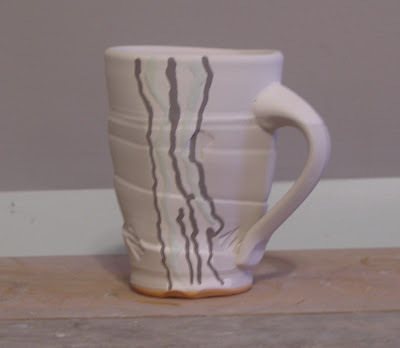 Glazing is finished, and I can't start loading. Can't clean up until all the pots are out of there...Guess I'm off to read a book. Cheers! Hope your holiday was spectacular. Regular silcone carbide shelves. These are the black shelves you always see, usually warped. Heavy as all get-out, too. These are about $125 for a 12 x 24 shelf; I shudder to imagine what the shipping cost would be. Nitrite-bonded silcone carbine shelves. These are those skinny (or skinnier), lightweight shelves with the little slits on four sides, called expansion joints, which are intended to prevent (or, really, delay) warping. As these are both lighter & cheaper than regular silicone carbide - and billed as no less strong - they seem like an obviously better choice. So obvious that I almost feel like I am missing something: why would anyone buy regular silicone carbide shelves? The nitrite-bonded are about $75 for a 12 x 24. Alumina Kiln Shelves. These are billed as an economical alternative to silcone carbide, and they are cheaper: I found prices ranging from $34 to $83. They are an inch thick and weigh a bajillion pounds (or, you know, 22 lbs: close enough.) Still, the difference between $34 and $75 is not inconsiderable since I will have to buy maybe 8 shelves....Hmm. Advancer. A girl can dream! These litte beauties weigh less than 10 lbs for a 12 x 24, and are only 5/16ths of an inch thick. Sadly, they are probably ("probably," she says, ha-ha. )out of my price range, at $175 each. I admit a great temptation, however: I am not particularly burly, and not getting any younger (looks can be deceiving!) and I hate to think of how I will load 20 years from now. Maybe I will hire a buff assistant. Yeah, okay, an assistant would be even spendier than fancy shelves, so maybe not. The door blocks fired without incident, much to my great relief. Um, just, YAY! 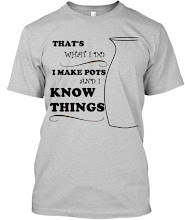 I'm firing a kiln! For the first time in months! I finally get to see how this heat-box performs. 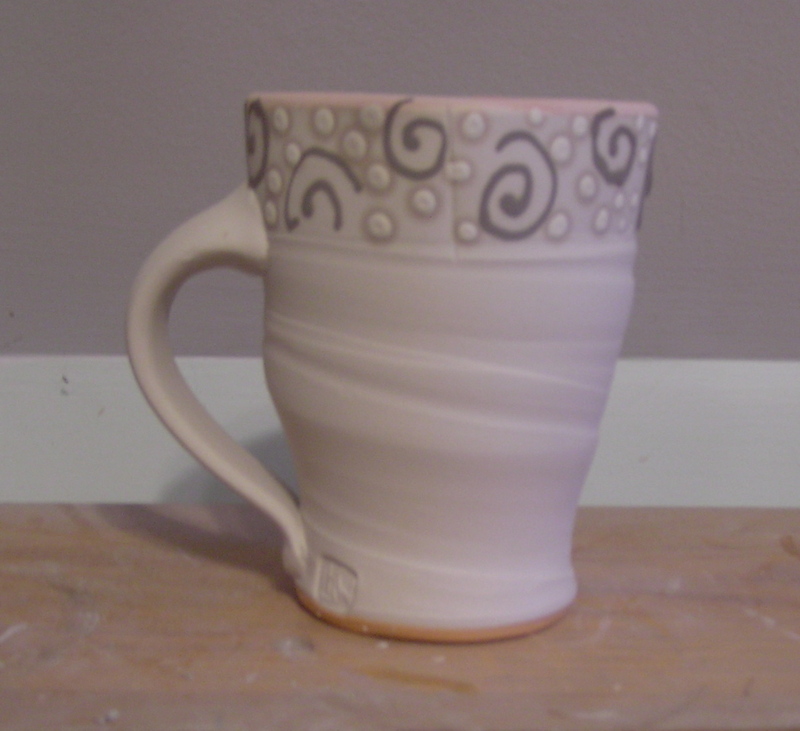 I am hoping for first glaze next weekend, but that's a mad lot of glazing in a short time, so...hmm, maybe Thanksgiving weekend? I can think of things that could go wrong ing this firing. I don't wish to enumerate them, for superstitious reasons, but the initials are "explode." 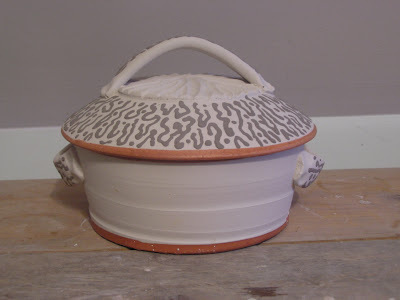 I consulted with Kelly Donahoe, the studio assistant at Portland Pottery ( and a darn fine potter herself.) 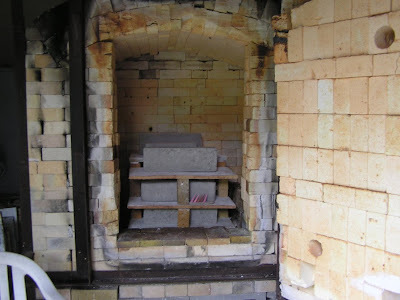 PP had a paid firing last month of some blocks much larger than these; a person was casting all the brick for their kiln. And you thought I was a glutton for punishment; I can't hold a candle to that chick. Anyway, Kelly told me that that firing was slower than the usual bisque, but not by much, just an longer overnight candle. One pilot on, door cracked, spies out, at 12 noon today. Close door and spies at 10 pm. Turn on second pilot tomorrow morning early, Say, 5 am. If that looks okay, turn burners on tomorrow at 12 noon. Begin a slow turn-up schedule, similar to a glaze firing, without the reduction slowing things down. Shoot right past Cone 10 to see 11 starting. *The handy-dandy mirror trick is simply holding a mirror up to the spy hole to see if it fogs up. If it does, the ware is still shedding water -- better stretch out the candle. Oh, speaking of gas giants: in addition to making a whole boatload of greenware, I also got some interesting reading done while waiting for water to evaporate. 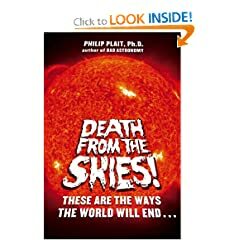 Among others, I read Death from the Skies! : The Science Behind the End of the World and From Eternity to Here: The Quest for the Ultimate Theory of Time . From one or the other of these excellent books, I learned that all the iron in the world - did I say the world? Scratch that: all the iron in the entire universe -- comes from the heart of stars going supernova. That's the only way iron, an element, is created. I'll never look at tenmoku the same again.